Instant pot tomato curry made with fresh tomatoes and spices makes a very delicious and healthy curry which you can enjoy with rice or with Indian breads like chapathi, nan, poori etc. This tomato curry is simple and easy to prepare and it is a vegetarian curry which you can quickly make using the instant pot with ingredients that you usually use for Indian cooking. 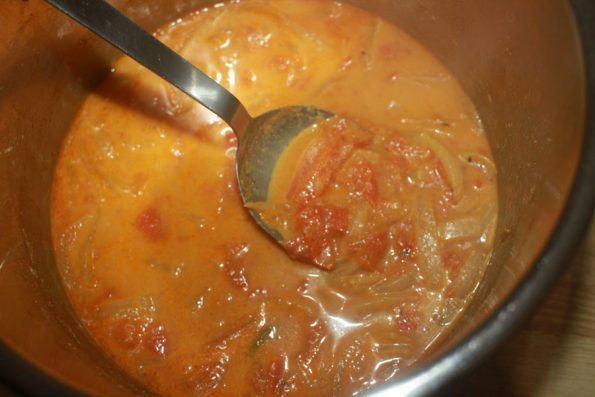 The best thing with this tomato curry is that it is so simple and easy to make and you can increase the amounts and prepare in even more large quantities if you wish so you will have enough leftovers. And it is also so healthy and delicious which requires very minimum efforts to make using the instant pot! Is This Instant Pot Tomato Curry Vegan? If you skip the heavy cream and use coconut milk only, you can make this a vegan dish which is very easy to do. Heavy cream (which is an optional ingredient in the list) is the only ingredient that is not vegan which you can easily skip or replace with coconut milk, cashew cream etc. What Are The Main Ingredients Used In The Preparation of This Indian Style Tomato Curry? 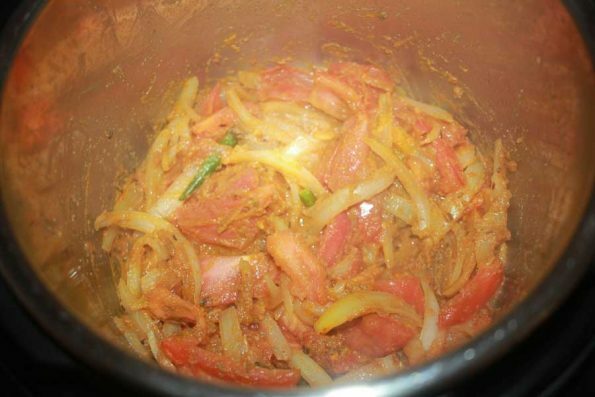 This tomato curry uses onions as one of the main ingredients apart from fresh tomatoes, spices etc. Obviously, fresh tomatoes, onions and spices form the main ingredients of this tomato curry, though you can adjust the flavors by trying different spices based on your preference. Make sure to use fresh, juicy tomatoes for the preparation of this tomato curry! 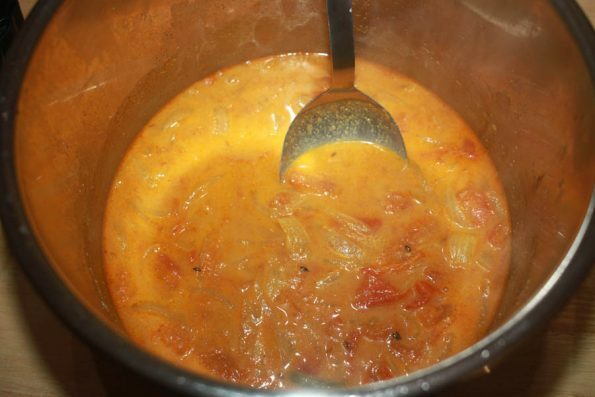 There are many tomato curry recipes in this blog which you can prepare on stove top (without instant pot) using a pan or pot including this simple and quick tomato curry recipe, onion tomato curry recipe, spicy tomato curry recipe, tomato fry recipe etc. Making tomato curry is usually easy and making tomato curry using an instant pot is even more easier. Also you can make a large batch of tomato curry in the instant pot if you wish, which you can store in refrigerator for few days or you can freeze the leftovers for more time (freeze each serving separately so you do not have to thaw everything together which is not advisable). If you decide to make large quantities of tomato curry in the instant pot, you can increase the amount of tomatoes used and adjust other ingredients accordingly. Is This Tomato Curry Healthy? 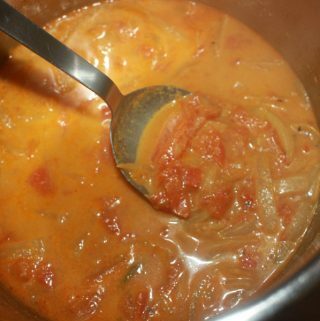 Yes, by using fresh tomatoes, onions and all healthy spices this tomato curry is so healthy and delicious. To make it even more healthy, make sure to use fresh and good quality ingredients like organic fresh tomatoes or fresh tomatoes from your own garden! This is also a great recipe to use any leftover tomatoes that you may have from your garden or harvest. 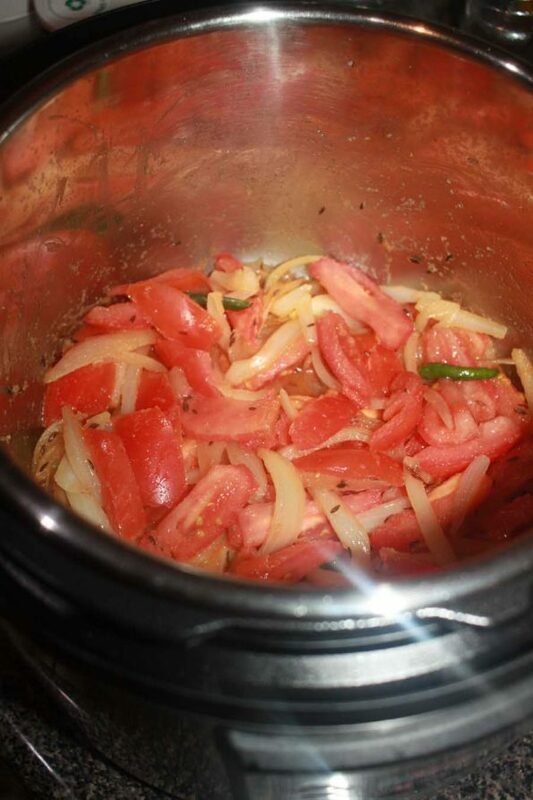 Instant pot tomato curry is very simple and easy to make and it is very delicious! You can also adjust the spices and flavorings based on your preferences if you wish to do so. So here is how you can make easy tomato curry in instant pot following this easy instant pot tomato curry recipe. Instant pot tomato curry is so easy to make and you can increase the servings if you wish, by increasing the amount of ingredients accordingly. Wash and peel the onion, slice in slightly thin long slices. 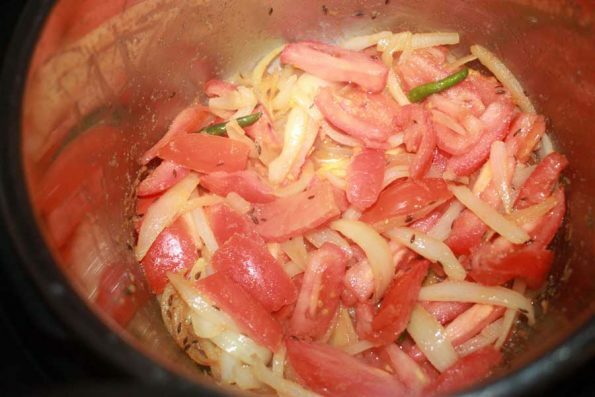 Wash and chop the tomatoes in long slightly thick slices, keep this aside separately from the onions. Add the oil in the inner pot of instant pot, press the saute function adjust to medium. Add the cumin seeds, and when the cumin seeds is lightly fried, add the curry leaves and fry for a few seconds. Add the sliced onions and saute for about 2 to 3 minutes. If needed, you can press the 'cancel' button and then again press the saute button and adjust to low. Add the ginger garlic paste and green chilies, saute for another 1 minute. Add the sliced tomatoes and salt, mix well and saute for another 2 to 3 minutes. Add the spice powders, mix everything well. Add the water, mix the contents and close the instant pot with lid in sealing position. Press the manual button and cook in high pressure for 4 minutes. It takes a few minutes (about 6 to 7 minutes for this recipe) for the instant pot to come to pressure and start cooking. Once the cooking is done, the pot will beep. Once the cooking is done and the pot beeps, press the 'keep warm/cancel' button and wait for the pressure to release naturally. If needed, you can do a careful pressure release after 10 minutes of natural pressure releasing. Once the pressure is all released, open the pot and mix the contents well. Add the coconut milk or heavy cream, mix again and the delicious instant pot tomato curry is ready to be served! enjoy the tomato curry with rice, chapathi, poori etc. If serving with rice, you can serve this tomato curry along with any other side dishes like potato stir fry, cherupayar thoran (green moong dal), red cowpeas with coconut etc which will make awesome combinations. To make this recipe vegan, skip the heavy cream and use coconut milk. 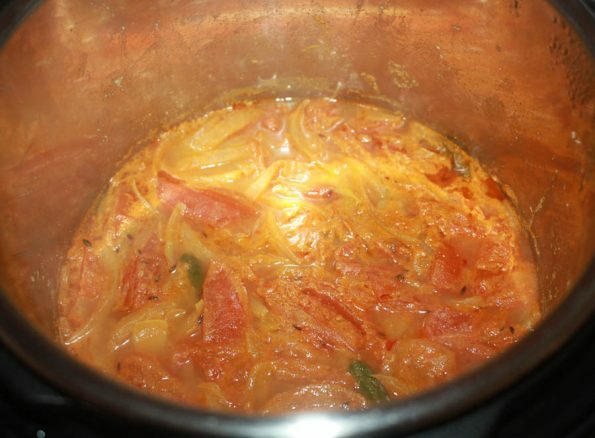 Hope you found this post on instant pot tomato curry helpful in making easy, healthy and delicious tomato curry!